As I wandered home from the paper shop yesterday morning, here in Cornwall, a small brown creature caught my eye. It was crouching low, hoping not to be noticed. 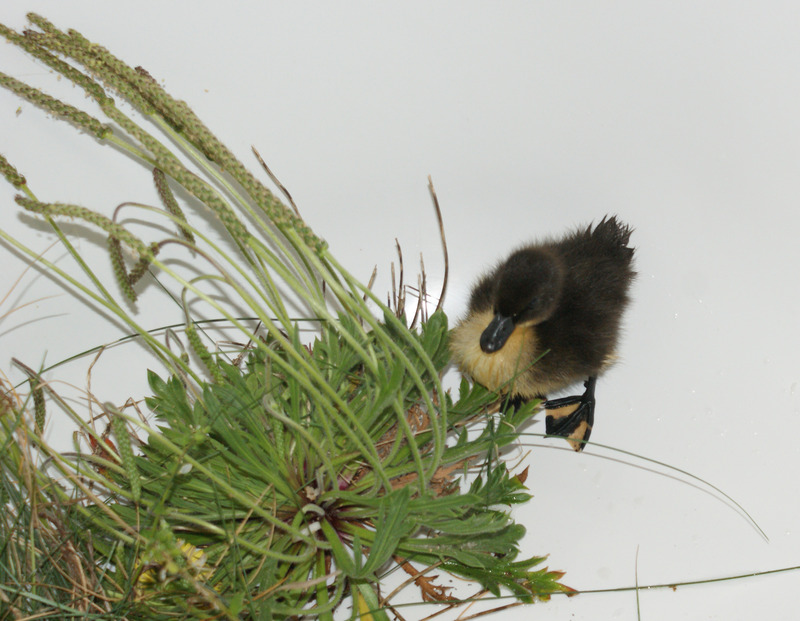 It was a duckling! It seemed happy enough, sitting in the sunshine outside the garden gate of a neighbouring cottage, so I left it. Now, we’re enjoying a few days away and my leisurely breakfast demanded a top up from the teapot, and another slice of toast (homemade bread from Baker Tom in Lemon Street, Truro – highly recommended)! As I waited for my toast to pop up, a loud and demanding chirping disturbed my peace. 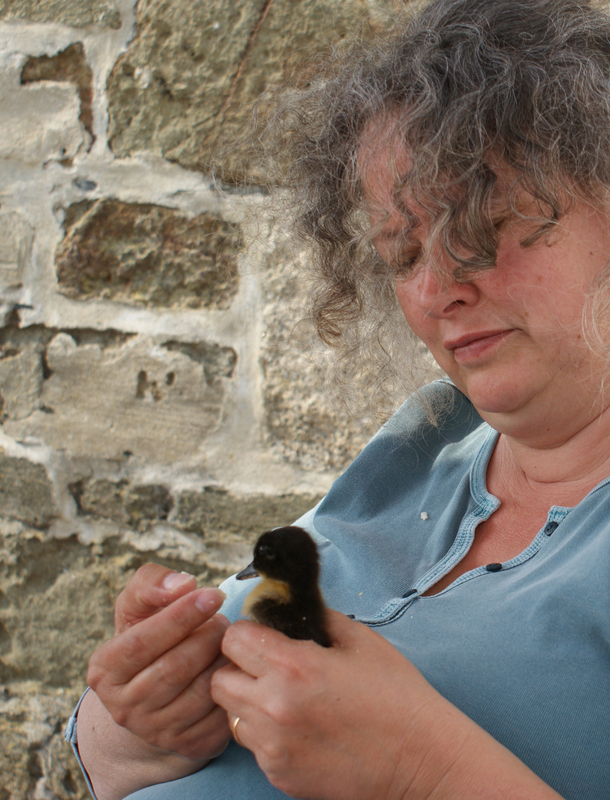 Duckling had followed me, it appeared, and was sitting on the back door mat of our cottage. At the same time, I noticed a predatory white tom cat passing the slatted gate at the end of the back yard. My family know I’m a bit soft when it comes to small creatures and although I will always choose to leave a wild youngster for it’s mother to reclaim, I can find no sign whatsoever of a mother duck or her remaining brood, here in the seaside village and I hated to think that the tomcat or a gull would finish it off. Have no idea whether she’s female, but if not (I’ll have to wait for markings to develop at about 8 weeks), she’ll change her name to Helston! Her temporary home, apart from when she’s on my lap, is the upstairs bath! I keep a drop of tepid water at one end and she particularly likes to eat her egg and noodles (in the temporary bank holiday absence of chick feed from an agri merchant) whilst paddling in shallow water. Her nest is a grassy cushion inside a newspaper ‘cave’, in which she cosies down to rest. As you can see, there are also some clumps of weed to peck in. I’ve read up that ducks won’t adopt an orphan, and will frequently try to drown it, so I don’t feel that I can take her to Helston’s lake. Besides which, her mother surely wouldn’t fly back to Helston and leave her brood miles away by the coast? She follows my hand around the bath and stays as close as possible. Enjoys her food by pecking it from my fingers and chirps whenever I leave her! Just like any other baby then! § 5 Responses to Flora Puddleduck! You made my morning telling us all about flora and her humble beginnings! just wonderful and I read up all about her and her beautiful poem..
She’s such a character and we’re so pleased she’s part of our family! Aw…so it was very smart of Flora to adopt you for her mum. Now that she is grown does she have a coop or a pond to swim in? Thanks for dropping by to see my chicken curtains. Oh yes – Flora has 2 ponds and a lovely hen-house hutch, with a ramp up and down which she waddles every day. She has a nest of thick shavings with a wall of sweet meadow hay in which to snuggle every night. She has regular treats of grapes (she only likes the expensive black ones), mealworms and regularly chases the collies away from their dinners in order to grab a beak-full! She’s one very pampered duck (and a very fat one)! « On the beach … with the border collies! You are currently reading Flora Puddleduck! at Adaliza.